Due to the unique length of today’s readings, this outline will be limited to a few points about the meaning of the texts and will not include the Lectionary text. To view the Lectionary 35 and 38 readings, click here. As the prophet foresaw, Jesus the Messiah suffered a violent death willingly and in accord with God’s plan, and yet those who caused the suffering were responsible for their actions (CCC 599). To all who are “weary,” that is, to those who have been in need for a long time, Christ’s passion can give solace. He suffered and we suffer, so we can be companions in suffering. We, too, can offer our own sufferings in union with Christ, so we can be collaborators in suffering. We can accept what we cannot change, and so, not rebel, so we can endure the difficulty as long as it is necessary, just as Christ did. The prophet foresaw what furious, violent men would do to the innocent, good man in their power. God is completely opposed to evil. God does no evil. Yet he respects the freedom of one person to do evil to another person. This is why it can seem like God abandons his beloved. Jesus was “in the form of God” because he is the Second Person of the Blessed Trinity, sharing the same divine nature as the Father. Yet Christ did not meet us as God. Rather, he humbled himself in the Incarnation, meeting us as a human being. He was obedient even to the point of death on the cross. So God the Father exalted him as our universal Lord. We are “in the form of God,” too. This is not because we are one of the persons of the Trinity. It is because we are made in the image of God. Yet we rebel and try to grasp “equality with God” by not accepting the moral law. In this way, we repeat the sin of Adam and Eve. We want to decide what is good and evil. We say the evil we do is good. We say the person who does actual good is wrong. “The apostolic faith” means what the apostles believed. 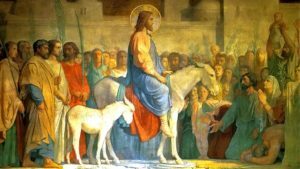 What the apostles believed is essential because they were the first followers of Christ, chosen specifically by Christ, and entrusted by Christ with teaching the Gospel. Christ went about doing good (Acts 10:38) and continued to be innocent goodness, despite what men did to him. Christ took the suffering, which his enemies sinfully inflicted upon him, and made it the means by which they can be forgiven and healed. The people rightly acclaimed that Jesus was “the one who brings salvation (Hosanna means ‘Save!’ or ‘Give salvation!’”). He did not bring salvation in they way they expected but in the way the Scriptures had announced.